Find out the details of the major sports coverage on offer across BBC television, radio and online this week. Visit our live guide for direct links to all our live sporting coverage - including text commentaries - while BBC Sport app users can also set event reminders so they never miss a moment of their favourite sports. All times are BST and subject to change. The first day of the World Snooker Championship gets under way, with last year's winner Mark Williams in action. There is also Premier League action from Etihad Stadium, as Manchester City welcome Tottenham. 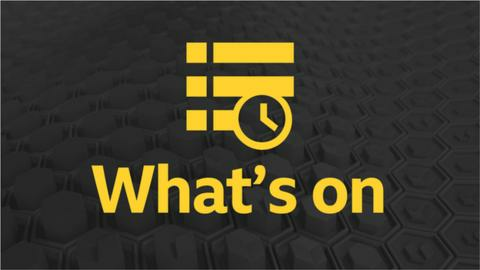 Watch all of the action from the BBC's comprehensive coverage of the World Snooker Championship and keep up with the latest from the afternoon's football, including Arsenal v Everton in the Women's Super League. Coverage of the World Snooker Championship continues on BBC TV, while BBC Radio 5 Live has updates from around the grounds for the 15:00 kick-offs in the English Football League, as well as live commentary of Chelsea v Burnley in the Premier League. First-round action continues in the World Snooker Championship, while there are two matches in the Premier League, plus Chennai Super Kings take on Sunrisers Hyderabad in the Indian Premier League and Warwickshire host Nottinghamshire in the One-Day Cup. Listen to live commentary as Manchester United host rivals Manchester City in the Premier League. There is also live coverage of the One-Day Cup and IPL, while coverage of the World Snooker Championship continues across BBC TV, iPlayer, Connected TV and online. Listen to live BBC Radio 5 Live Sports Extra commentary from the One-Day Cup and the Indian Premier League, look ahead to the Azerbaijan Grand Prix with BBC Radio 5 Live and keep up to date with all of the latest action from the Crucible. Liverpool host Huddersfield in the Premier League with build-up, full commentary and post-match reaction on BBC Radio 5 Live. More coverage from the World Championship Snooker across the BBC, as well as third practice and qualifying from the Azerbaijan Grand Prix in Baku and One-Day Cup cricket as Middlesex take on Sussex. Also follow Premier League action as Tottenham take on West Ham. You can view BBC Sport output as well as listen to our radio sports programming on BBC iPlayer. The BBC Sport website is available via desktop, mobile, tablet and app, giving fast and easy access to the live streams, text commentaries, news, reports, schedules and videos, as well as highlights of the day's action. The BBC Sport app is available free on Apple and Android devices. The BBC is not responsible for any changes that may be made. For more details of forthcoming coverage, visit the specific sport page on the website. Coverage on BBC Red Button can be subject to late schedule changes. The FA Cup fifth round takes place between 15-18 February - and BBC Sport has it all covered on television, radio and online.